The Turk Hyde Mini Park Pilot program is in full swing with a steady stream of activators providing programs in the coming weeks. In addition to our regular collaboration with friends from the Demonstration Gardens who daily provide games, gardening, and arts, here's a schedule of what's ahead including gentle movement classes, soulful singing, drum circles, and crochet jams. It's all free and appropriate for all ages and abilities. Providing games, visual and performance arts, and gardening. A meditative practice combing breathing, yoga, and seated movements inspires calm, wellness and beauty. Crochet Jam—a public, art-making event that's embracing and inclusive, with no attempt made to dictate the creative process nor judge the finished project—is meditative, liberating, and empowering. Ramekon O'Arwisters started Crochet Jam in 2012. His social-art practice is rooted in a cherished childhood memory that's steeped in the African-American tradition of weaving in a calm and non-judgmental environment without rules or limitations. Check out one of Ramekon's larger works on display at George and Lennie Cafe (277 Golden Gate) where he's been holding down a summer long residency with Crochet Jams every Tuesday morning. Rita Whittaker sings from classic soul, gospel and other forms to uplift and inspire herself and those around her. On October 5th, Rita will be borrowing from the Patti Labelle songbook. "There is a lot of hidden talent here in the TL. Talent that has been thrown away, but has been found," says Rita Whittaker. "There is a light that shines within me that I hadn't seen in a long time. This is an opportunity to shine my light to my neighbors here in the TL." Dino Smith brings the connective power of drumming to radiate throughout the park. Come dance, move, and join the circle. Join us any Tuesday through Friday between 1-3pm at the Turk Hyde Mini Park! 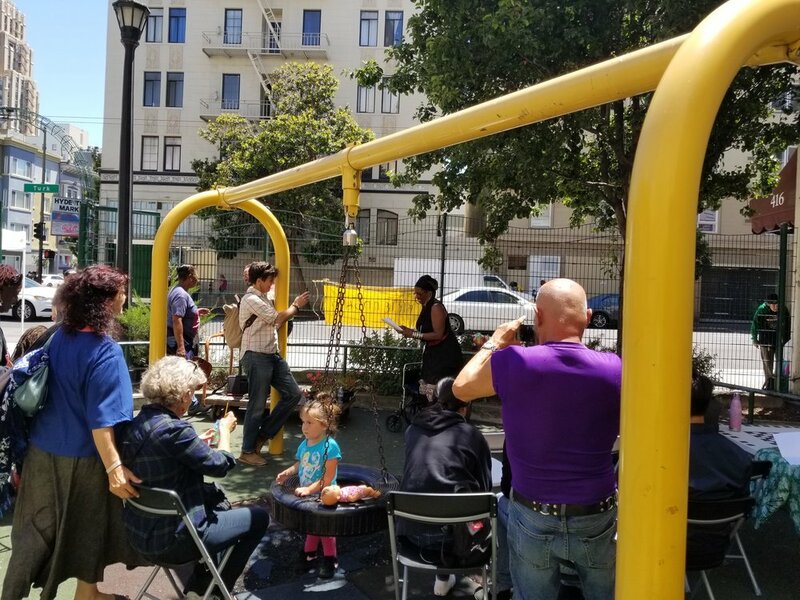 The Turk & Hyde Mini Park Pilot Activation Program is being undertaken in collaboration with Friends of Turk-Hyde Mini Park, a resident-led Steering Committee, which guides the pilot in partnership with TLCBD. The goal of this pilot program is to bring and promote positive, healthy activation through community members so as to create a sustainable model, which could inform management of the park following renovation. TLCBD has established a micro-grant program to assist with funds up to $500.00 for Tenderloin-based activators to lead programming activities. To receive the micro grant application, request more information, or attend a Steering Committee meeting, call the TLCBD office at (415) 292-4812 or email Phoeut@tlcbd.org, subject “Turk-Hyde Mini Park”. Download the application and return to the TLCBD office or via email to Phoeut@tlcbd.org.